Praxis Core Academic Skills for Educators Tests are a series of three tests that measure reading, writing, and mathematics skills. The tests are used for either determining which candidates are qualified for a teacher education program or as part of the licensing process for those who have graduated with education degrees and wish to become teachers. Prepare with our Praxis Test Study Guide and Practice Questions. Print or eBook. Guaranteed to raise your score. Get started today! The math test is made up of selected response and numeric entry questions, while the reading exam is entirely made up of selected response questions. The writing exam consists of selected response questions and too written essays. The exams can be taken as three separate tests on different days or as a single combined test battery. Although a former version used to be available in both paper and computer formats, this new version can only be taken on a computer. Tests are offered at Prometric testing centers and some colleges and universities across America. Praxis Test Flashcards. 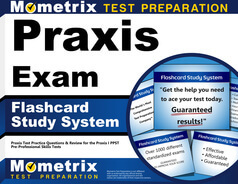 Proven Praxis test flashcards raise your score on the Praxis exam. Guaranteed. The Core Academic Skills exam tests are offered during windows that occur continually throughout the year. They are not offered every day of the year; usually they are available a couple weeks every month. The exams are only offered in English, but test takers who have a primary language other than English may be allotted extra time to complete the exam. Test takers who are eligible for extended time are given an additional 50% time limit to finish their tests. If this applies to you, the official Praxis website has all the information you need in order to apply for extended testing time. The Praxis Core reading exam contains 56 selected response questions with an 85 minute time limit. About 35% of the questions will be on Key Ideas and Details. Another 35% will be on Integration of Knowledge and Ideas, while approximately 30% of the questions cover Craft, Structure, and Language Skills. An onscreen calculator will be available for the math test. The Praxis Core writing test lasts 100 minutes. Each of the two required essays has a 30 minute time limit, while the selected response section is 40 minutes. There will be between 6-12 questions on Text Types, Purposes, and Productions, and 28-34 questions on Language and Research Skills for Writing. 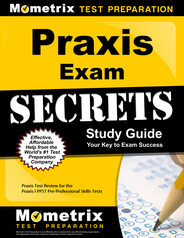 Taking numerous Praxis Core practice tests is recommended for test day success. Minimum passing scores on the Praxis Core exams are determined by the particular state or agency that is requiring the applicant to take the exam. You’ll want to check with the state or agency you’re applying to in order to get the latest exact minimum scores for passing, but here are some general guidelines. As of this writing, in most states minimum passing scores are 150 on the math test, 156 in reading, and 162 in writing. Test takers disappointed in their scores may retake Praxis Core exams, but must wait at least 21 days before doing so. If they retest without waiting at least 21 days, their score on the retest will be invalidated. Those who elect to retake a Praxis Core exam are strongly encouraged to examine the detailed score report and determine in which specific sections they have the greatest room for improvement, and focus their study efforts on those sections in particular. The fees for the Praxis Core exams tests are $85 each, when taken individually. Registering for two of the exams costs $125, and registering for all three costs $135 (and when registering for multiple exams, they all must be taken at the same time). Cancelling a registration is allowed and 50 percent of the test fees will be refunded if the cancellation is made at least three days prior to the test date. During registration, test takers can select up to three institutions to receive a score report for free. Additional score reports can be sent to institutions after the test for $40 each. Scores are considered valid for up to 10 years following the exam. For those who are taking the Praxis Core for the purpose of licensure and need their score sent to a designated state or agency, the Praxis website lists states to which test scores are automatically sent. If the state is not on the list, the test taker will have to designate a state or agency to receive one of the three free reports when registering for the test, or otherwise pay to have the score sent after the test. There are also fee waivers for some students who take the Praxis, though fees will only be waived once a year regardless of how many times the test is taken. To receive a fee waiver, a test taker must be currently receiving financial aid, currently enrolled in an undergraduate or graduate program, not in possession of a graduate degree, meet certain income guidelines, and be required by a state or agency to take the Praxis Core for licensure purposes. On the day of the exam, test takers must take an admission ticket as well as a photo ID. Calculators are not needed nor allowed for the Praxis. Personal items such as cell phones are not allowed into the testing center. Score review services are offered for those who feel their score does not accurately reflect how they performed on the exam, but only within three months of the test date. The fee for score verification is currently $55. Explore our free Praxis review provided by Mometrix. Check out our premium Praxis study guide to take your studying to the next level. If you benefit from these materials, just click the link below! To compliment our Praxis book, we also offer extensive flashcards for even more Praxis test prep help. We hope you enjoy our products! Your purchase helps us make more great, free content for test-takers just like yourself.